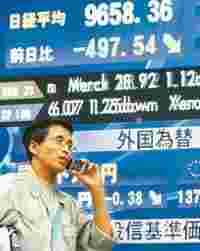 Hong Kong: The performance of Asian markets on Thursday was mixed, as investors remained cautious about the global economy after a series of interest rate cuts by some of the world’s major central banks tried to revive confidence. South Korea and Taiwan reduced borrowing costs a day after central banks in the US, Canada and Europe announced cuts on Wednesday, followed soon after by China. Hong Kong cut borrowing costs earlier on Wednesday, a day after Australia lowered its policy rate. The Dow Jones Industrial Average was up 1.46% to 9,393.66 in early trades. At 8.30pm India time, it was down almost 1% to 9170.65, wiping away early gains as in previous sessions. On Wednesday, the index pared early gains to eventually close 189 points lower, despited the concerted action by the central banks. European markets shed some early gains on Thursday ahead of Wall Street’s opening, but remained in positive territory, with British banking stocks in particular enjoying a strong rally in the wake of the government’s £50 billion (Rs4.26 trillion) rescue plan. German stocks rebounded from the worst three-day slump since July 2002 as banks gained on speculation governments will step up measures to shore up financial markets. The European Central Bank brought forward plans to lend banks unlimited cash and pumped a record $100 billion (Rs4.87 trillion) in overnight funds into the financial system after an interest-rate cut failed to soothe tensions in money markets. And Russia’s Micex Index rallied as much as 17% . Wall Street also gained some confidence after the government reported new applications for unemployment benefits dropped last week from a seven-year high. The Labor Department’s report matched projections, though claims still remain at elevated levels due to the struggling economy. While rate cuts can take up to a year to work their way through the economy, there were some positive signs on Thursday that corporate earnings might come in better than expected. International Business Machines Corp., a Dow component, posted third quarter results that beat forecasts and reaffirmed its full-year earnings outlook. In Asia, Tokyo slipped 0.5%—to a five-year low—following a rollercoaster session a day after the index slipped more than 9%, its worst single day drop in 21 years. Sydney lost 1.5%, Taipei shed 1.45% and Shanghai was almost 1% off. However, traders in Hong Kong took heart from the rate cuts with the Hang Seng Index rising 3.3% a day after plunging 8.2%, while Singapore added 3.4%. Seoul also rose, and closed up 0.6%. Although the Bank of Japan did not lower its interest rates—already at just 0.5%—it did inject 4.0 trillion yen ($40 billion) into the market, the biggest one-day injection since the crisis began. Fears that Japan is on the brink of recession were raised also, when figures showed core machinery orders, a key gauge of corporate capital spending, slumped 14.5% in August from the previous month. The figure represents the fastest drop in more than two years. World markets have been plummeting in recent weeks following the collapse of US investment bank Lehman Brothers Holdings Inc. and the government bailout of insurer American International Group. A $700 billion rescue package for the ailing US financial system agreed by lawmakers in Washington last week failed to lift markets. The Asian Development Bank does not expect any slowdown in lending to developing nations despite a deepening credit crisis that will likely put a damper on global growth. But member countries would likely demand greater accountability in the bank’s lending policies as the financial turmoil deepens, managing director General Rajat Nag said. AP, Reuters and Bloomberg contributed to this story.